IMPORTANT! The Emergency 200-min plan was discontinued by Iridium in February 2017. 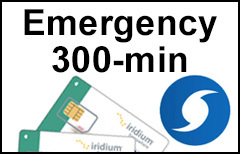 The Emergency 300-min Prepaid Plan is currently the least expensive one-year plan with global coverage offered by Iridium.